MBC's 'Idol Star Athletics Championship', returning this Lunar New Year, has announced its participant lineups in the following categories: rhythm gymnastics, aerobics, and archery. Filming for the Lunar New Year special 'ISAC' will begin this January 15, and the event will include track & field, bowling, archery, rhythm gymnastics, and aerobics. The show will be MC-ed by Jun Hyun Moo, Super Junior's Leeteuk, and A Pink's Bomi. In rhythm gymnastics, Cosmic Girls' Cheng Xiao will be attempting to defend her gold medal title, with challengers Gugudan's Sally, CLC's Seungyeon, LABOUM's Haein, April's Rachel, and Dream Catcher's Ji-U. In men's aerobics, ASTRO will be attempting to defend their gold medal title. The challengers include UP10TION, The Boyz, IMFACT, Golden Child, and ONF. 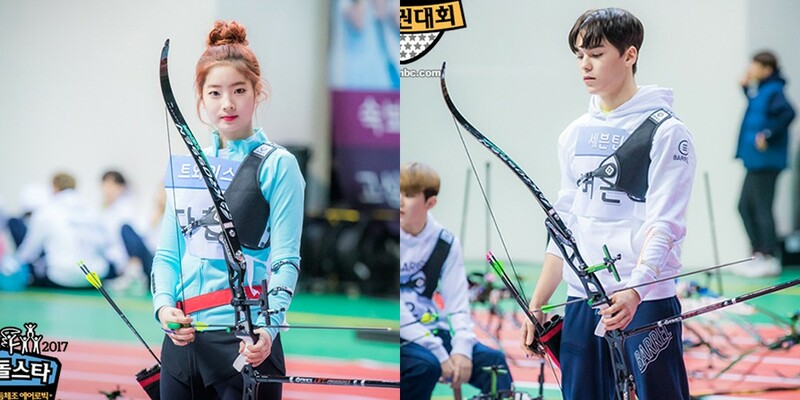 Finally, in archery, 7 male and 7 female idol teams will be going for the gold. The female teams are TWICE, Red Velvet, G-Friend, Lovelyz, Gugudan, DIA, and Oh My Girl. The male teams are BTOB, VIXX, Seventeen, MONSTA X, NCT 127, UP10TION, and NU'EST W.
Who's excited for 'ISAC 2018'?